The client tasked us with creating a contemporary take on the minimalist style for the refurbishment of this apartment. This called for simplicity, a reserved colour palette, an emphasis on functionality, an almost austere atmosphere with a minimal amount of furniture and a maximum of space, and the use of modern materials. The challenge for our team was to carefully plan the layout, the colour scheme and lighting to achieve a maximum sense of space. Walls and ceilings in all the rooms were painted in shades of grey and white, which perfectly reflect light. Our designers chose multi-level lighting with built-in neon and halogen lights, not just in the ceiling but also in the walls, niches and shelving. We opted for glass for the tables, which emphasised the cool atmosphere and complemented them with large chandeliers. Finally, to maintain the sense of open space, a simple bar counter was installed to divide the kitchen off from the living room. 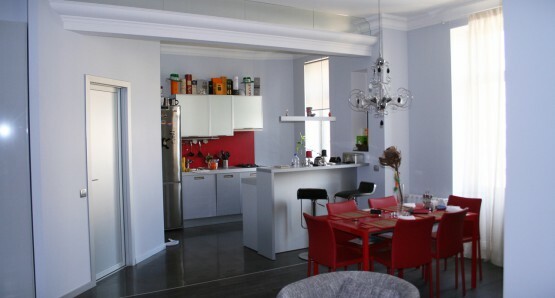 In a bold statement, our interior decorators used bright red to accent the colour scheme. This added an attractive dynamism to the overall effect. However, for the floors and upholstery, we kept to an understated monochrome. 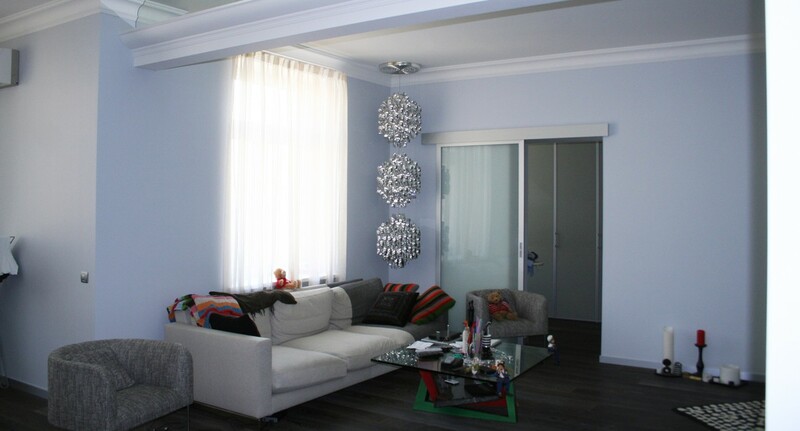 The doors were painted in a blue grey to complement the shades of the floor and walls and we used mirrors and glass to achieve a sense of smoothness and light. Construction Bear created a home with a quiet, restful atmosphere where the client could unwind after an intense working day. The simplicity of lines and forms, the abundance of light, the lack of clutter all work together to evoke a sense of peace and harmony.